For a blogger Leonard Cohen is a daunting musician to review. Who am I to critique the work of an undeniable legend? On the other hand, how can I simply sit by and ignore an important new release from one of Canada's greatest exports? That's the quandary I faced when approaching his new album. Obviously, I decided to take the plunge. 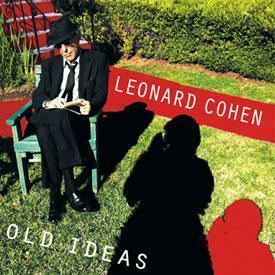 Old Ideas, the twelfth studio album from the Rock And Roll Hall Of Famer, comes out this week. The record should be welcomed by anyone who needs something slow and sombre to help them wallow in self-pity and depression. Not surprisingly, the lyrics of songs like "Show Me The Place" and "Crazy To Love You" paint vivid images of lives that haven't played out as planned. The arrangements are subtle. On "Amen" it's a banjo and strings that take you on a meandering trek to the grave. A swirling organ and Cohen's vocals are all that are required to turn "Darkness" into a smothering (in a good way) shroud. It's a familiar husky whisper that greets fans on the opening track "Going Home". The 77 year-old poet has never been known for the strength and technical perfection of his voice. This album though, he relies more than ever on his backing singers. On many songs it's they who actually lead the way, providing almost all of the melody and nuance. It all comes together in the perfect storm of "Come Healing". A gorgeous song of redemption and reaffirmation that proves that one doesn't need to be a powerful singer to create a powerful and moving work of song. Yes, some of the songs do drag or have a tendency to sound alike. However, there are enough staggering moments on Old Ideas to show that there is plenty left in Leonard Cohen. Best tracks: "Come Healing", "Darkness"